Sweet sesame seed balls are a Chinese sweet treat usually eaten on special occasions such as Chinese New Year. 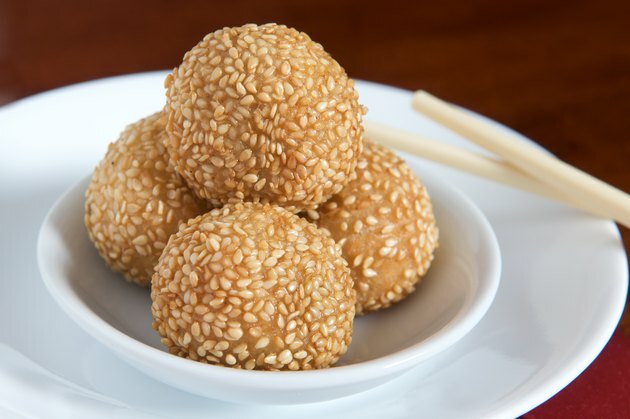 Only a few ingredients are needed to make sweet sesame seed balls, including brown candy -- also known as peen tong -- glutinous rice flour, red bean paste and sesame seeds. However, some of the ingredients may only be found in specialty Asian grocery shops. While these little balls are deep fried, they are low in fat, but high in calories. One 2-1/2-inch diameter sweet sesame seed ball contains 132 calories. Sweet sesame seed balls are a calorie-dense treat, meaning it has a high-calorie content compared to its serving size and can cause you to eat more calories than you intended. Most of the calories, nearly 80 percent, come from the balls' carbohydrate content. One sweet sesame seed ball contains 26 grams of carbohydrates and 1 gram of fiber. By comparison, two slices of bread contain 25 grams to 30 grams of carbohydrates. Carbohydrates are an important nutrient, providing your body with energy. But some of the carbohydrates in the sweet sesame seed ball come from the sugar in the brown candy. Sugar adds calories and provides energy, but offers very little nutritional value. You should limit your intake of foods with added sugar to less than 5 percent to 15 percent of your daily calorie intake, or no more than 300 calories a day on a 2,000-calorie diet. While the sweet sesame seed balls are deep fried, they are not high in fat. One ball contains just 2 grams of total fat, making up only 14 percent of the total calorie content of the treat. The sesame seed ball is also not significantly high in protein, with 2 grams per ball. Both protein and fat are essential nutrients your body needs to function properly. Fat should provide 20 percent to 35 percent of your calories, while protein should be 10 percent to 35 percent. The sweet sesame seed ball also makes a low-sodium treat with just 2 milligrams of sodium per serving. Almost all Americans consume more sodium than they need, according to the U.S. Department of Agriculture. The higher your daily sodium intake, the higher your blood pressure. Including more low-sodium foods on your diet can help you limit your intake. Ideally, you should limit sodium to 1,500 to 2,300 milligrams a day.